Petra Kvitova serves against fellow Czech Republic competitor Petra Cetkovska during the second round of the 2014 U.S. Open tennis tournament on Aug. 28 in New York. Patrick McEnroe announced his resignation Wednesday as general manager of player development for the U.S. Tennis Association, the nonprofit group that organizes the U.S. Open. This year’s Open shows how little top U.S. talent has emerged during McEnroe’s tenure. He took the job in April 2008. No American male player who was under 20 at that time won a men’s singles match at this year’s U.S. Open. Young American women have done better, but Nicole Gibbs was the only one who was younger than 20 when McEnroe took over who reached the third round in singles. But as I wrote Monday, the decline of U.S. tennis had begun long before McEnroe (who is a tennis analyst for ESPN, which owns FiveThirtyEight) got the job of developing players. 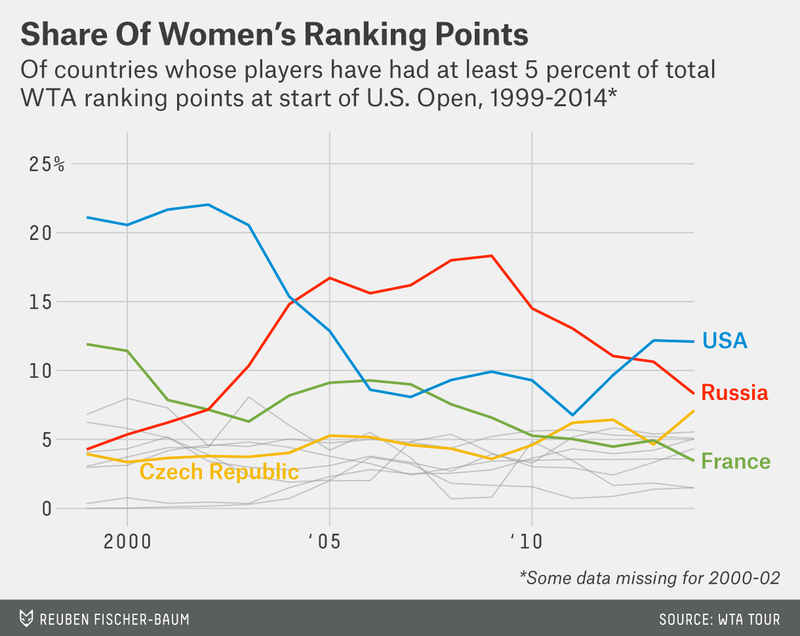 American women’s global power in the sport — by share of total WTA Tour ranking points — bottomed out in 2011 and has rebounded since. 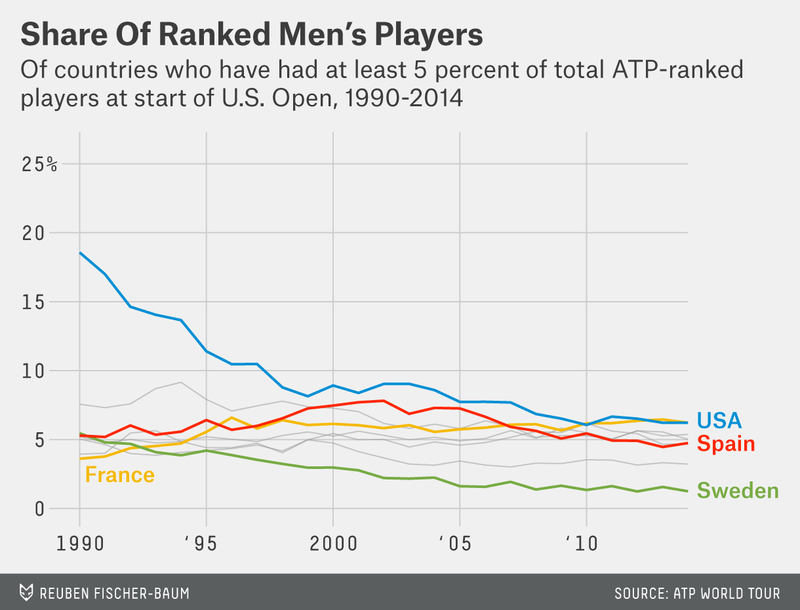 American men’s share of global ATP World Tour ranking points has kept falling since 2008, but much more slowly than the rapid decline between 1990 and 1998, from about a quarter of world power to one-tenth. At the end of this post are four charts that fill in the details about when the U.S. lost its dominant position in the sport and which countries have taken over. 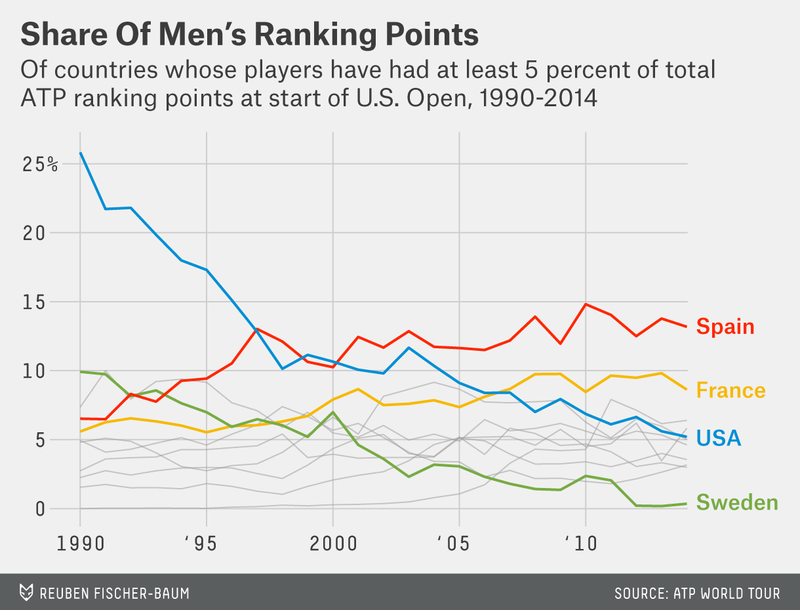 Spain has led the U.S. in men’s ranking points each year since 2001. France overtook the U.S. in 2007. Sweden, though, has seen the most precipitous dropoff, from second in the world in 1990 to 39th today. 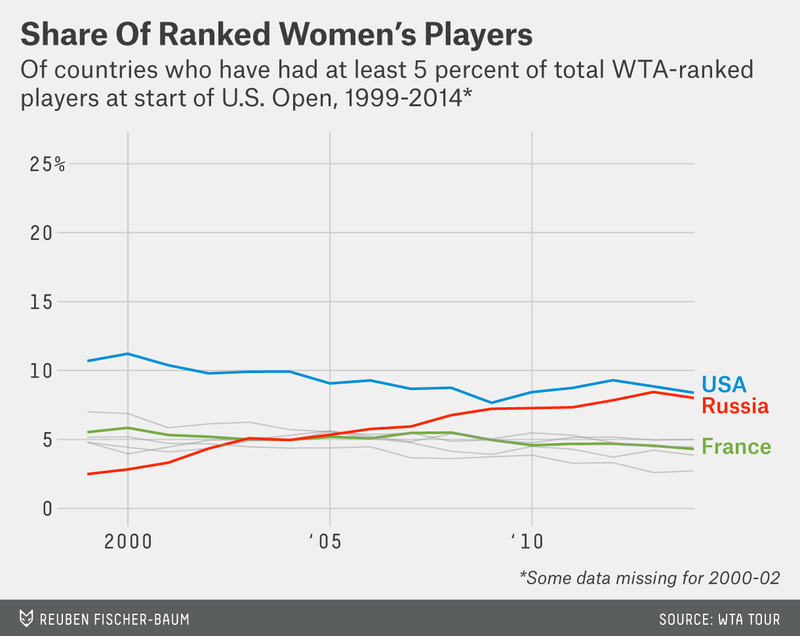 With their recent comeback, American women retook the top spot from Russia, thanks in large part to world No. 1 Serena Williams. The Czech Republic has risen to challenge the two leaders, which remain well ahead of a declining France. Trends in share of ranked players are similar, though less dramatic, because a player who falls from No. 1 to No. 100 counts the same by this measure. There are still plenty of Swedish ranked men and French ranked women, but their influence has waned. My colleague Paul Schreiber helped me gather the data from the ATP and WTA ranking archives on their respective websites. The WTA data for the years 2000 to 2002 omits 100 ranked players for each year; the data is missing from the website and a WTA spokesman wasn’t able to immediately provide the numbers. None of the missing players was ranked in the Top 400, so their omission will have little influence on global ranking-points share, though slightly more on share of the world’s ranked players. My colleague Andrew Flowers helped compile the annual ranking data — from the first day of the U.S. Open each year — using the statistical programming language R.